The month of May, bursting forth with its welcoming rays of sunshine – was a memorable month for the centre as it marked its half-year anniversary. There was no better way to celebrate this other than Sadhguru himself coming to visit and conduct the Mystic Eye Event! In one beautiful gesture, volunteers came together to decorate and enliven the venue, adorning the space and stage for Sadhguru. It was truly heartwarming to see their dedication whilst weaving the backdrop; losing their sense of time and being totally immersed in the magic of the sea grass and their fingers. We are delighted to announce the formation of the homegrown UK Sounds of Isha! The members have been trained under the guidance of experienced Isha musicians from India and performed a short repertoire at the centre, enchanting everyone with a medley of Isha favourites, before finishing with everyone's favourite Alai Alai. The fusion of the sitar sounds with the flute, guitars and traditional percussion – electrified the atmosphere and left everyone hungry for more to dance and stomp to! We were honored to host the photo and video team from the Isha Yoga Centre in India, who captured the many facets of the centre and its array of activities. It was a once-in-a-lifetime experience as the centre transformed into a chorus of light and laughter! We are all fired up to announce that as of June the centre will be offering "drop in sessions". These 1 hour 15 minutes sessions combine dynamic hatha yoga practices with a guided meditation, to leave you with a sense of lightness, freedom and harmony. They are bite-size tasters of what Isha has to offer and are open to anyone over the age of 15. So why not drop in for a ‘drop of spirituality’? 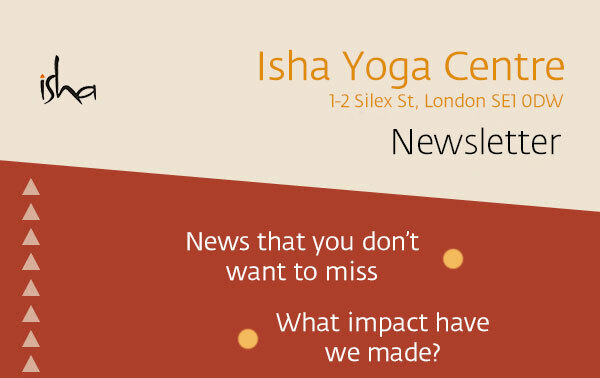 Every week keep your eyes peeled for free lunchtime isha meditation sessions that offer you a necessary stress-free break from the pressures of a working environment. The sessions are short (45 to 60 mins long) and allow you to recharge and regain inner peace, balance and joy to better face your everyday challenges. They are open to all over the age of 12, so treat yourself with a break and soak in the tranquility that pours from the centre. In the lead up to the Mystic Eye event, the centre was a hub of activity with programmes happening almost daily. 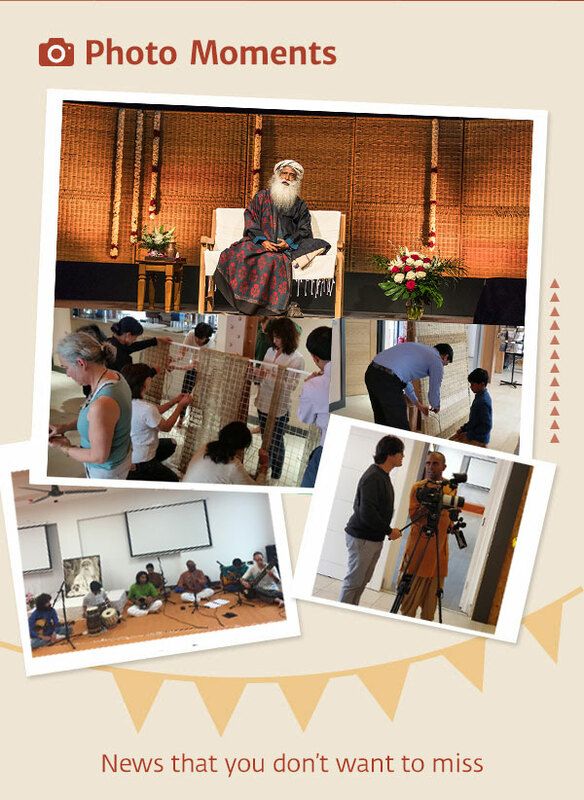 May saw the offering of three Inner Engineering programmes at the centre, two free yoga workshops, six hatha yoga programmes, two hatha yoga correction sessions and three hatha yoga guided sessions. In May we started offering free guided Shambhavi Mahamudra Kriya practice followed by presence time every Wednesday and Friday from 5.45pm until 6.30pm. Contribution: Please account for £10 to cover expenses. Those who have attended the Inner Engineering Online and have not been initiated into Shambhavi Mahamudra Kriya can attend from 4:30pm to 6:30pm. Contribution: £10 to cover expenses. 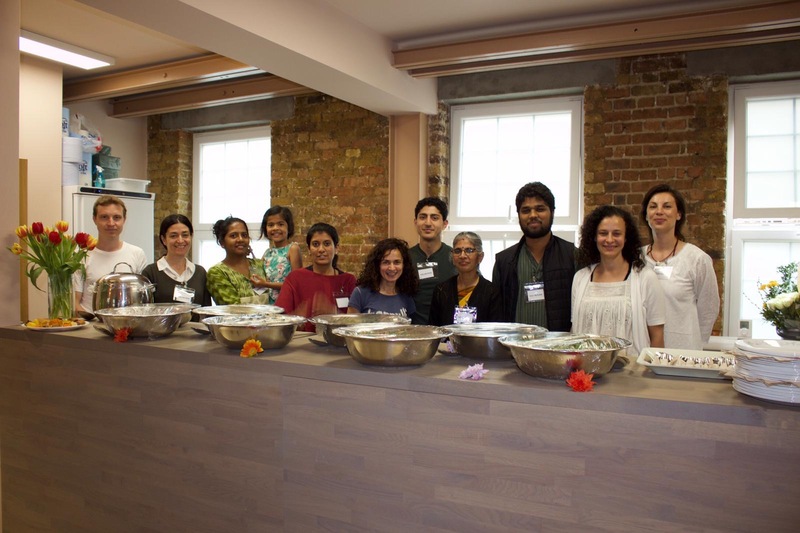 I have had the good fortune of volunteering at the IYC London for about 3 months now. I was struck by the meticulous attention to tiny details paid by the volunteers during the programmes, and wanted to see what inspired them to do so. My experience of volunteering at the centre has exceeded all my expectations and been a wonderful blessing for me. To be fully ON always and ready to do whatever is needed without any inhibitions is such a liberating feeling. I constantly find myself drenched in the moment and paying close attention to things I would have dismissed as trivial otherwise. Volunteering has also made a big difference to the intensity of my daily practises. I feel much more involved doing them and appreciate their many subtleties. I try to volunteer once a week now and it’s definitely the best part of the week for me! The vibrancy and the gentle Isha spirit that I imbibe at the centre stays with me throughout the week and finds expression in other activities as well! It is truly a privilege to part of this amazing family.